This one of the rare recipes for dough in old cookery books. Cooks knew how to prepare dough, so it was not considered necessary to provide recipes. 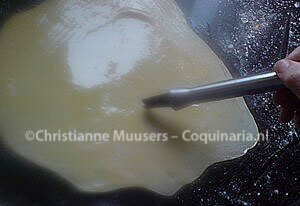 In the cookbook from Lancelot de Casteau, dating from 1604, is a recipe for a kind of puff pastry. It is part of the recipe for ‘tourtes de blancmanger’, where the crust is filled with sweet almond milk thickened with rice flour. From the Ouverture de cuisine from Lancelot de Casteau. In 1983 a facsimile edition was published, and the text can also be read online. This recipe is excellent in combination with the mushroom pie from the same cookbook. Combine flour with salt. Melt the butter in a microwave or small pan. The butter must not turn colour. Stir the melted butter with water and egg. Knead with the flour to a supple, elastic dough. Cover with plastic foil or a towel and let rest for half an hour (not in the refrigerator). Divide the dough into two portions. Roll each of them out to a thin sheet. Spread melted butter on one dough sheet, cover with the other sheet. Roll out together if necessary (depends on the thickness you want), and dress a pie mould or springform with it. 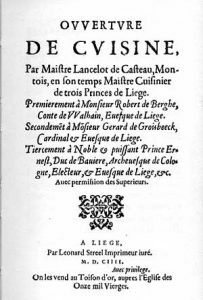 Lancelot de Casteau, Ouverture de cuisine (1604, facsimile editie Herman Liebaers, Léo Moulin, Jacques Kother, Antwerpen/Brussel, 1983), tekst online.